What Kind of Idiot Goes the Speed Limit? I actually jumped my first car. I mean, all four wheels off the ground. On purpose. It was stupid. And that’s the difference between me and other people who drove like that: I’m not proud of it. I wasn’t skilled: I was lucky. (And stupid.) The only reason I never totaled my first car is because the engine blew first. The only reason I didn’t total my second car is because the officer who wrote the speeding ticket swore he only caught up with me because of the stop sign. That made me think. I thought, “This is stupid”. Me. It helps that I’ve seen a lot of dead bodies at accident scenes, which is really attention-grabbing. Winter is the time when we tend to weed out the reckless, at least until they get their rides replaced. That white stuff on the road? It’s not sand from Jamaica, folks. 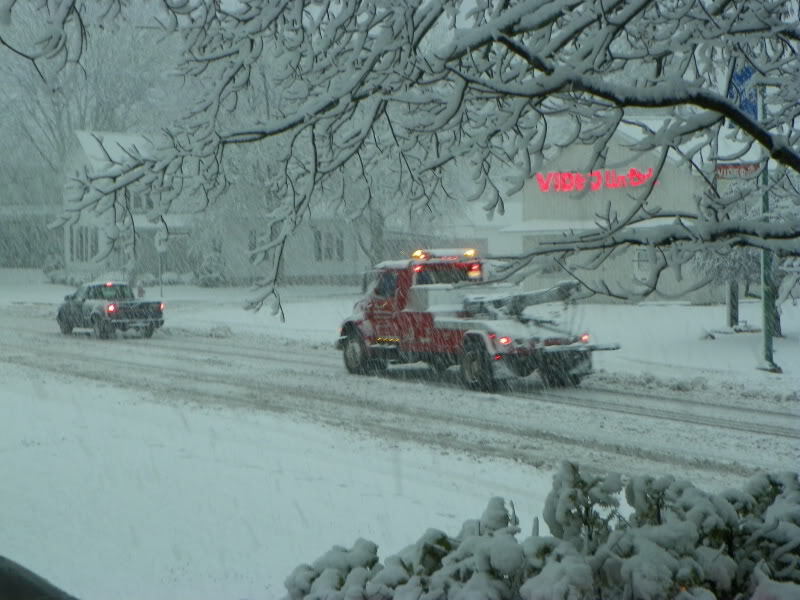 Snow sent me into the ditch three times in my younger years, and what I learned is that the ditch is fine if you’re a drainage consultant or a ditch digger, but it’s not so good for travel. We’re nearing the end of the latest never-ending Indiana winter, so freezing precipitation is only possible for another few months or so. This late it tends to melt off within a day of the moment I finish shoveling. What have we learned from another season of slippery roads? Well, the first thing we learn, every year, is that people don’t learn every year. The first snow “event” of the fall brings the same thing: People sliding off roads all over. In cars, I mean. Some are brand new drivers, or just unlucky, but a lot are idiots. Many of the unlucky are victims of the moronic. That just doesn’t sound like the voice of reason. The problem with stressing snow is that some people assume when the snow is plowed, the danger is over. “You can’t say black ice! That’s racist!” Fine, call it Sudden Ice Syndrome, then. SIS kills. Freezing rain? By definition, it’s freezing. Some people only seem to hear “wa-wa rain”. On a related note, I wonder what would happen if the movie “Frozen” was real? Wouldn’t everyone who came close to Elsa end up with strains, sprains, and concussions? Hopefully Kristoff’s sled has four wheel drive. Not that it would help, which brings us to one of the big dangers: people who put too much faith in all-wheel drive. “Yes, I know it’s snowing, but I have an SUV!” Does the first letter stand for Stupid? It does if you drive 70 in dry weather, and also 70 in wet weather. Yeah, I see you driving behind me, and you know what? The closer you get to my taillights, the more I’m going to slow down. That’s why I’m going 53 now. There’s no point in me being the 532nd person this month to point out that four wheel drive does absolutely no good on ice. The people who need to hear it aren’t listening. They’re listening to their car stereo, maybe, or more likely their cell phone. They’re also cussing a lot, because that’s me glued to their front bumper, and I’m now doing 49. Not only do SUV drivers get up to speed in bad weather (when not behind me), they go out when they don’t have to. What’s the best rule of driving in ice or snow? Don’t. My wife can, and does, make fun of me for being a weather junkie, but I can tell her three days ahead if there might be bad weather. Maybe there won’t be, but if you’re almost out of bread anyway, why not stock up? And get some dog food too, so the mutt won’t be tempted to eat his owners in a worst case scenario. Then, if the bad forecast doesn’t pan out … so what? But four wheel drivers think, “Let’s go out!” I suppose you people ski and ice fish too. Oh … you do? Never mind. But there is one good thing about dumb drivers. When the road conditions are good for maybe 45 mph, and you get passed by some moron who wants to go 60, there’s no better feeling in the world than going on another two miles … to find him spinning his wheels in a ditch. No, I didn't get off the porch to take this. You kiddin' me? I'm surprised that people who experience weather conditions like that don't learn how to drive in snow. Most of them figure it out by late February -- and then completely forget it again by the following autumn. I regularly sneer at the fools who pass me and end up in the ditch up ahead....if I am putzing along below the speed limit -- you really should be doing the same. I was taught long ago that you should stay in two wheel drive--that way if you get into the trouble, the four wheel drive might pull you out of it.